When to Seal a New Pressure-Treated Deck? When to Put Sealer on a Deck After Staining? What Is the Best Waterproofing for a Deck? Whether your wooden deck is a palatial patio of premier redwood or a simple stoop of Southern yellow pine, every deck needs protection from the elements. The harsh effects of ultraviolet rays, wind, snow, ice and foot traffic wear on the deck surface. Wood may crack, splinter and become discolored unless the deck is covered with a high-quality sealer. With the best sealer, quality application and routine maintenance, the wooden deck will provide years of attractive use. Wood decks take a beating from sun, water and use. Home improvement center shelves are stocked with a dizzying array of deck paints and sealers. All coverings whittle down to two main types: water-based and oil-based. Both have their advantages and disadvantages, depending on ease of application, maintenance and protection of the wood deck. The best covering for a wooden deck is an oil-based stain with transparent iron oxide pigments. Clear sealers are inadequate, unable to protect the wood from the sun's harsh ultraviolet rays. Water-based sealers, while easier to apply, are inferior to oil. A oil-based sealer with pigment provides a thin covering, shielding the deck from the drying effects of the sun and soaking into the pores of the wood, protecting the wood from water. Do-it-yourself homeowners prefer water-based deck coverings because these products are easy to clean up and dry very quickly. 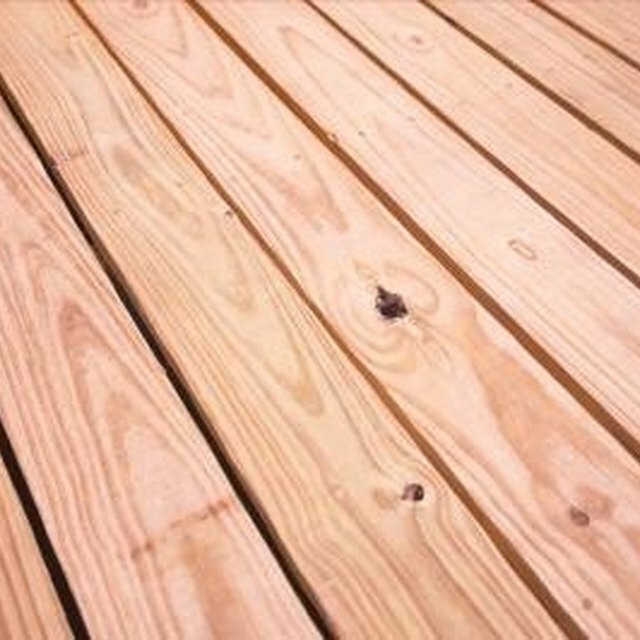 Water-based products, however, do not provide the best coverage and protection that wood decks need. Chemist Mark Knaebe from the US. Department of Agriculture Forest Products Laboratory reports that oil-based coverings penetrate the wood pores deeper than the water-based products, giving the deck a better defense from fading, water damage, water stains and mildew. Some homeowners may find that oil-based stains are more difficult to apply. These stains require an exceptionally dry deck before and after application, while water-based stains will tolerate damp conditions. Oil-based sealer applications may also leave lap marks under the hands of inexperienced homeowners, while water-based coatings are much more forgiving. Even so, oil-based sealers are the best protective covering for wood decks. Preparation and proper application can make the difference between a superior covering or a mediocre covering. The wood deck must be clear of all mildew, grease, debris and stains. If applying an oil-based stain, the deck must be bone dry and applied before and during a period of no rainfall. The best time to apply the coating is in the morning or late afternoon when the sun is not bearing down on the deck surface. For the best coating and even coverage, the stain should be applied with a brush. Some professionals apply the stain with a sprayer, a few boards at a time, and recoat the sprayed area with a hand brush. Most stain manufacturers recommend a minimum of two coats. Oil-based stains generally require a new coat every two to three years, while water-based stains last slightly longer. Subsequent coatings always depend on the quality of the initial application, the use of the deck and its location in the yard. If the deck is located in an exceptionally sunny area of the yard, the deck may need to be recoated every year. Some stain manufacturers offer warranties on their products. The best products also allow subsequent recoatings without the need to remove the previous finishes. When Do I Seal a New Cedar Deck? What Is the Best Way to Protect a Wood Deck? Do I Need to Use a Primer to Stain a Wood Deck? What Is a Good Fir Wood Stain?